KYLE BARGHOUT: This was one boxset I really wasn’t looking forward to. KB: As much as I love Big Finish’s output and the tweaks they have made to other parts of the Doctor Who range to improve it, anything New Who was always going to be unwelcoming for me. The RTD era was one of the weakest series of the shows entire history in my opinion. It set a trend of smugness and an air of self satisfaction that I feel has only grown under Moffat. It sacrificed plot and logical story telling for dramatic yet nonsensical, emotional scenes. Worse, the 40 minute format utterly ruined any chance of detailed character development. The planet Funderell is an unusual place. With oceans you can walk on and a single village for the entire planet, it’s not your run of the mill alien world. The locals, Wavewalkers who hunt on the semi solid oceans, seem simple but have unexpected depths – but that’s not the only surprise in store for the Doctor and Romana. After the TARDIS is lost beneath the waves, help appears from that most unexpected of sources, a fellow Time Lord: and not just any fellow Time Lord, but an old friend of Romana’s. But why is she here and what is she looking for? On this planet of secrets beware exploring too deeply: you may just drown! It’s an interesting tale, this one. It starts feeling like a fishing tale from a few hundred years go and then swerves into a deep mystery with a lot of players; each with their own agenda. Every twist and change of gear managed to very effectively ratchet up my interest. While at first thinking this felt a lot like a historical, the story threw in a lot of interesting sci fi ideas; a lot of mysteries and some twists and made me double take. It all leads up to a nice cliff hanger that makes you long for the next part. Tom Baker and Lalla Ward are on fine form and it’s a solid cast. Joannah Tincey is especially good as Romana’s long time friend from the academy and their verbal sparring (with each being cordial but keeping a lot back) is a joy to listen to and it’s nice to see it’s so central to the story. While all two-parters need the second part to fully judge I’m looking forward to seeing how this one plays out. The Merseyside docs are famous for the ships they’ve built – but the Doctor, Mel and Ace are about to discover the newly reopened yards are not building the kind of ship you might expect. A mysterious customer, a no questions asked (or at least answered) approach from the new owner and a near magical Dark Alloy building material are going to ensure the latest vessel launched from these docks is like nothing else on Earth. The workers pour their blood, sweat and tears into their work. But this time the blood is going to be much more literal. I do like the team of up the 7th Doctor, Ace and Mel. It’s a good dynamic and all three of them bring an energy and enthusiasm to the roles that makes the ears perk up and takes the story up a notch. While it’s a fun story, with an 80s Who vibe, it’s more a romp than complex mystery. But that’s not a bad thing and the tale isn’t without a job lot of nice twists and, for 80s Who, some very gruesome moments. The aliens have a nice twist that fits well with the 7th Doctors period enemies: while very different, their mystical elements fit in well with Fenric or the Destroyer, given the villains’ mix of magic and technology. The plot point of Mel meeting up with an old friend never really gets developed, and that’s perhaps one minor regret from this tale. That felt like it could lead to something more and while Todd Heppenstall interacts well with Bonnie Langford it did seem there should have been a bit more to that plot. Some of the story’s other parts make up for this though, with the spies, portals to other worlds and sacrificial nature of the craft the docks adding some interesting elements. If you like the 7th Doctor stories then this is a solid and enjoyable tale. It’s not so grim up north? Shoulda finished Shada? Well now they have! 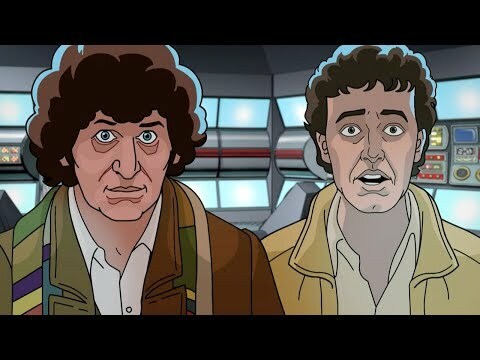 Tom Baker returns as the Fourth Doctor in a previously unbroadcast story, combining original live-action footage with hand-drawn animation. To be released on DVD, Bluray and digital download.